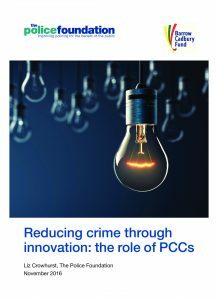 As Police and Crime Commissioners enter their second term, questions remain about what will drive further innovation to build on the reforms introduced in the first term. For many forces, obvious efficiencies have already been realised and partnerships formed, furthering the need to consider new and potentially more radical avenues for change. In partnership with the Barrow Cadbury Fund, the Police Foundation held two roundtables at the 2016 Labour and Conservative party conferences to explore these issues further. A thematic summary of discussions can be found in this briefing.